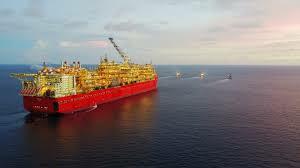 The Royal Dutch Shell owned Prelude FLNG facility has reached its final operation location, the Brown Basin gas field, approximately 400km from the North West coast of Australia. This facility, the biggest floating FLNG facility, is 488m long, has a width of 74m and the height from the keel to the main deck of 44m. It is made with more than 260,000 tons of steel and its displacement at full loan is 600.000 tons. The commissioning phase of Prelude has started. A new concept on how to lift each of the three 5000kW thrusters from the bottom of the service trunk, into the service area 23m higher for inspection and scheduled maintenance work, is a result of a close cooperation between the owner, the designer and shipyard (Technip Samsung Consortium), the thruster manufacturer and Beacon Finland. The floating facility is planned to be at its production site over 25 years, and it requires that the thruster can be maintained inside the facility without dry-docking or production stops. Main part of the construction and equipment related to the described solution is designed and manufactured by Beacon Finland. “We have put a lot of both financial resources and working hours into this project. We have in return gained a lot of experience in demanding design work and cooperation with many of the biggest actors in the marine industry. Beacon has also been able to generate some valuable innovations. It has been a great honor to be part of this significant project and we hope to gain challenging design and manufacturing projects from all over the world also in the future. We have once again shown that the Finnish innovativeness and cooperativeness give excellent results and satisfied customers”, says Tuija Hörkkö Managing Director of Beacon Finland.